Can I drink my growler there? No. 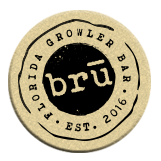 While there is a cost benefit to filling a 64oz growler instead of ordering it by the pint, it is a violation of Florida law to consume a growler on the premise where it was purchased. So… keep your growler sealed while you’re drinking with us and enjoy it once you’re home.